My esteemed colleague Luke has made something of a career out of documenting the savage charms of the Beach(es) in winter (I – II – III – IV – V). The neighbourhood, hiding in plain sight, is a pleasant advantage to Toronto life in the summer and a brutally beautiful reminder of nature’s wrath in the winter. Frankly, I prefer the latter. Try walking along the boardwalk some winter night; be sure to bring lights. Plus the Beach has a newly-renovated library, which just reopened last week. I was patron number four (and the first to return an item). My chief complaint about the place is the lack of WiFi, which I voiced to many a staffmember on opening day – even to the unusually tall media-relations queen. (“Why is it that, in a few years, the only place you won’t be able to get wireless Internet is the public library?”) They know it’s a problem, but I am not to hold my breath. The washroom locations are, moreover, a bit unpredictable. 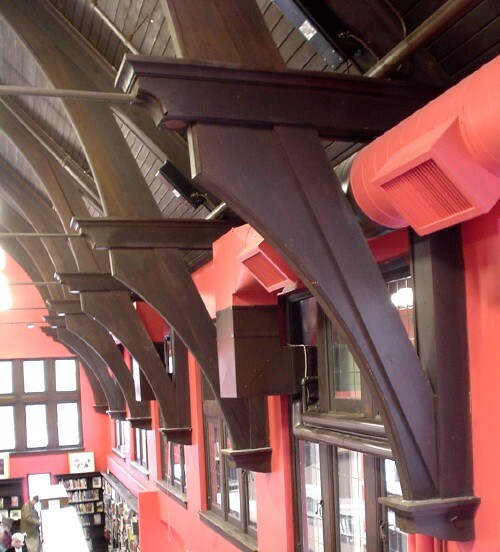 But the place is absurdly tasteful, with surprisingly Modernist easy chairs, power outlets in abundance, good typography if not good wayfinding, a joyously loud Victorian-style floral carpet, and the original red walls with massive wooden brackets. According to the library system’s head of branches, the collection has not decreased significantly even with the elimination of many of the old spacious wall shelves. 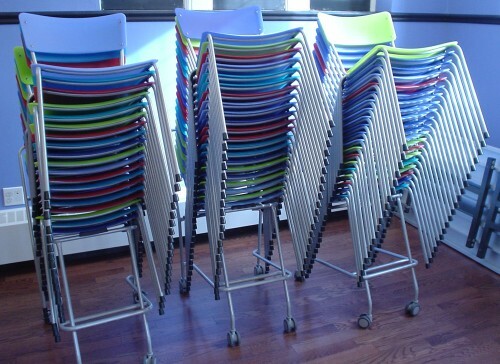 And the Beaches Library certainly has the jolliest set of occasional chairs available in the east end. 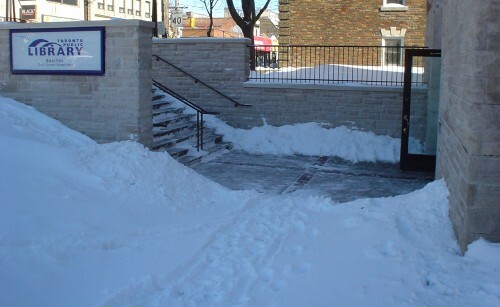 Accessibility was a known issue to be addressed in the redevelopment. The original Queen St. entrance was to be restored, but it is below grade. I reacted with alarm when I passed by one day a few months ago and saw a concrete path snaking down the small hillside to the walkway that leads to the new restored entrance. I know very little about architectural accessibility, but still, I thought, that can’t be a 1-in-12 slope . I also thought There’s no way they’re gonna keep the snow offa that. I asked inside, and a defensive librarian with a Bayman accent complained that (a) I couldn’t expect her to shovel it (who said anything about that?) and (b) a private contractor is supposed to do the job. Obviously they’d done only half the job. In olden days, she told me, their custodian on site would take care of things on the spot. Apparently we don’t live in those olden days. Now, which of the following is cheapest?